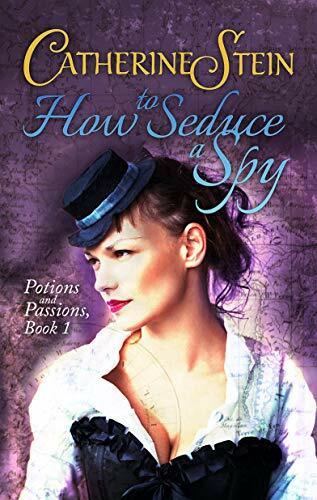 Dear readers, tonight with me is an agent of the British crown, with a deceptively simple directive: end the magical potions crisis, by any means necessary. He’s here to tell us about how posing as a bodyguard and joining the beguiling potions expert on her continent-hopping expedition led to danger of both life and heart. Ah, Ainsworth. Welcome. Please sit down. Sir? It was my understanding that all reports were to be conducted in private. It appears we have an audience. Indeed. Given the importance of this mission, Parliament has decreed that the information be made available to this carefully selected committee. Now, please introduce yourself to these fine people. Captain Henry Charles MacAlaster Ainsworth, intelligence officer, retired. My current title is that of Civilian Consultant to Her Majesty’s Armed Forces. You may also know me as Lord Henry, youngest son of George Ainsworth, Marchese di Murlo. Not that my father’s Italian title puts us anywhere but on the fringes of British aristocracy. His money on the other hand… well, I’m certain you understand. Tell us a bit more of your background. Your childhood? Your family? I don’t see how this is especially relevant to my report. Very well. I grew up traveling often between Italy and England for my father’s business dealings, and Scotland where my mother’s family lives. My father stopped traveling when I was a teenager, and my brothers are happy to remain in Italy growing grapes, but I have never stopped craving travel and adventure. I live in London now, but my occupation takes me all over the world. Dear readers, tonight with me is Fitzsimmons Noakes, the modest captain of the airship ‘The Centennial Kestrel’, the fastest Channel-Runner in business I am told. We were actually hoping to interview Miss Alice Kittyhawk about her adventures, but she had pressing obligations in London and sent Captain Noakes in her stead. Captain Noakes has a peculiar way of speaking which might sound a bit odd to modern ears, and we suspect that this particular interview is NSFW. You have been warned. No offense, but I was expecting one Miss Alice Kittyhawk… erm… Mister…? Yes, quite, so you can tell us something about Miss Kittyhawk? How long have you known her? Since she was a nipper, used to perch on me knee and I’d sing her a ditty or two, didn’t I? Not that dull patriotic rubbish, mind you, proper songs like ‘Ere’s to the Grog and Lily White Thighs. I’ve ‘eard Alice whistling the tunes aboard the Kestrel, proud as a peacock I were, to know I been such a good influence. You’ll find a young hen full as good as your….. I get the gist of the song, thank you. Was this in the village of Rottingdean? Dear readers, tonight with me is a special person, one who has turned into a cultural icon of our generation. The Protagonist is honoured to welcome Nikola Tesla to the interview couch! Tonight he will tell us about his amazing discoveries, and his almost unnatural connection to electrical currents. Can you describe to us your affinity to electricity? How does it feel / look? As a child I could feel the lightning building up to strike, and I ran to touch it. Miraculously, instead of being killed, I felt as if my body and soul had come alive. The sensation was like you might feel the wind in your face, or a spray of water. I did not realize that others didn’t feel this and that I was something of a freak. Because of my extreme sensitivity to currents and light, I developed what others might call Phobias. I did not like to look at women’s jewellery because of how it bent the light. I started trying to control this sensitivity through calculations. Numbers, especially the number 3, were like an invisible structure that I wove around the world. I always had to do everything by 3’s. After I nearly died of cholera, I became terrified of germs and reluctant to shake hands. I obsessively washed my eating utensils. People thought I was quite an eccentric! Some even thought I was mad…a ‘mad scientist’ if you will. How did this affinity affect your scientific work? My brain was like a finely tuned receiver. I could visualize the inside of devices…and when I built them, they worked perfectly! I could travel to imaginary places and speak with the people I met. My sensitivity became so painfully intense that I thought I would surely die…and that was when I received a communication from a race of energy beings who spoke to me in currents. This was not a hallucination: the Aon were from the dimension of ‘subtle matter’. They spent their lives studying the universe, and now they wished to study and exchange knowledge with me.